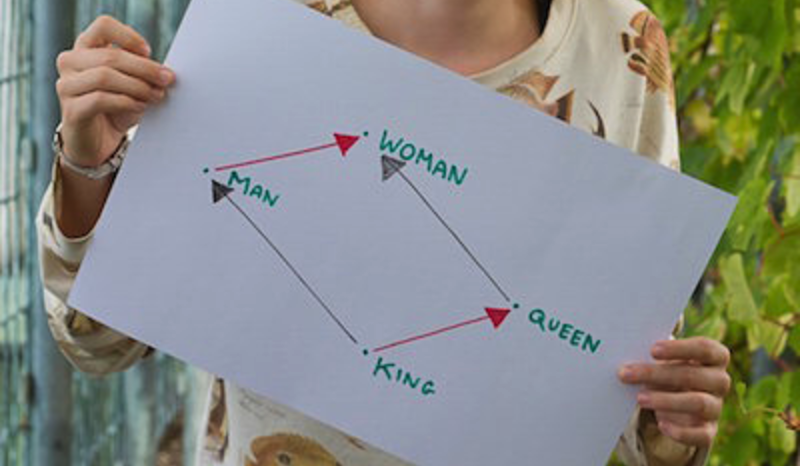 In 2013, word2vec popularized word vectors and king - man + woman = queen. The king/queen example is not difficult, and I don't know whether it was tested or discovered. A better evaluation would use a set of challenging pre-determined questions. SAT questions are more interesting. Selecting from fixed answer choices provides a nice guessing baseline (1/5 is 20%) and using a human test means it's easier to get human performance levels (average US college applicant is 57%; human voting is 81.5%). Michael Littman and Peter Turney have made available a set of 374 SAT analogy questions since 2003. You have to email Turney to get them, and I appreciate that he helped me out. Littman and Turney used a vector-based approach on their dataset back in 2005. They achieved 47% accuracy (state of the art at the time) which is a nice benchmark. They made vectors for each word pair using web data. To get one value for "banal : originality" they would search AltaVista for "banal and not originality" and take the log of the number of hits. With a list of 64 connectives they made vectors with 128 components. I'm using GloVe and word2vec word vectors that are per-word and based on various text corpora directly. Since the vectors are not specific to particular pairings, they may at a relative disadvantage for the SAT task. To get a vector for a word pair, I just subtract. I have one word2vec model: GoogleNews-vectors trained on a Google News dataset, providing 300d vectors. 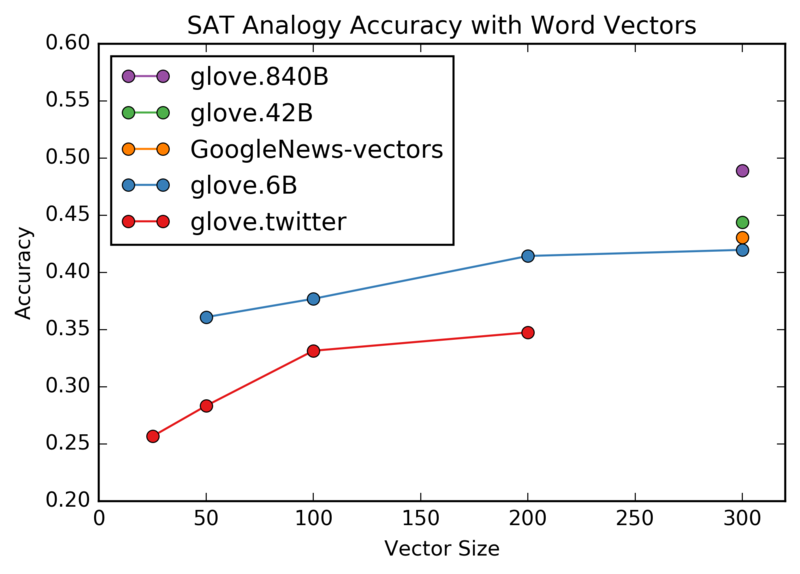 The best word vectors for the SAT analogies task (glove.840B) achieve 49% accuracy. This outperforms the 2005 47% result, but is still within the confidence bounds of 42.2% to 52.5% that they report. Holding the training set constant and varying the size of the vectors affects performance on the SAT analogies task: bigger vectors work better, though performance may be plateauing around 300d. Twitter data does markedly worse on the SAT analogies task. This is consistent with Twitter's limitations and reputation for being less than erudite. Trained word vectors provide a fixed vocabulary. When a word was missing, I used a vector of zeros. Most embeddings only missed one to eight words from the 374 questions, but glove.twitter missed 105. I also checked accuracies when excluding questions that had unsupported words for a set of embeddings, and the results were remarkably close, even with the Twitter embeddings. So the accuracies are due to the embeddings and not just gaps in the vocabularies. It is pretty impressive that word vectors work as well as they do on this task, but nobody should consider word vectors a solution to natural language understanding. Problems with word vectors have been pointed out (source, source, source, source). Still, the idea of word vectors (translating sparse data to a learned dense representation) is super useful, and not just for words. See implementations in Keras and in TensorFlow. These methods are not the best-performing non-human technique for these SAT analogy questions. Littman and Turney report several. Latent Relational Analysis comes in at 56% accuracy, against the average US college applicant at 57%. This is a case in which "the average human" is not a good bar for measuring AI success. The average human has a remarkably small vocabulary relative to what a computer should easily handle, not to mention that the average human would not be admitted to most colleges you could name. I'm grateful to the DC Deep Learning Working Group for helpful discussions, and particularly Shabnam Tafreshi and Dmitrijs Milajevs for sharing references at the January 26, 2017 meeting. Thanks also to Travis Hoppe of DC Hack and Tell for always doing cool things with NLP. Thanks to Peter Turney for providing the dataset and commenting on distances. An example of word2vec popularization. My code is available at ajschumacher/sat_analogies. All but 20 of the 374 questions have five designed answer choices; those 20 have four and "no : choice" as the last option. To maintain comparability I kept those questions in, though it means a human guessing baseline should be slightly over 20%. For efficiency, I used GloVe values as 2-byte floats, which is lossy. I also tested with 4-byte floats, and the results varied by at most one question, while being much slower to generate. 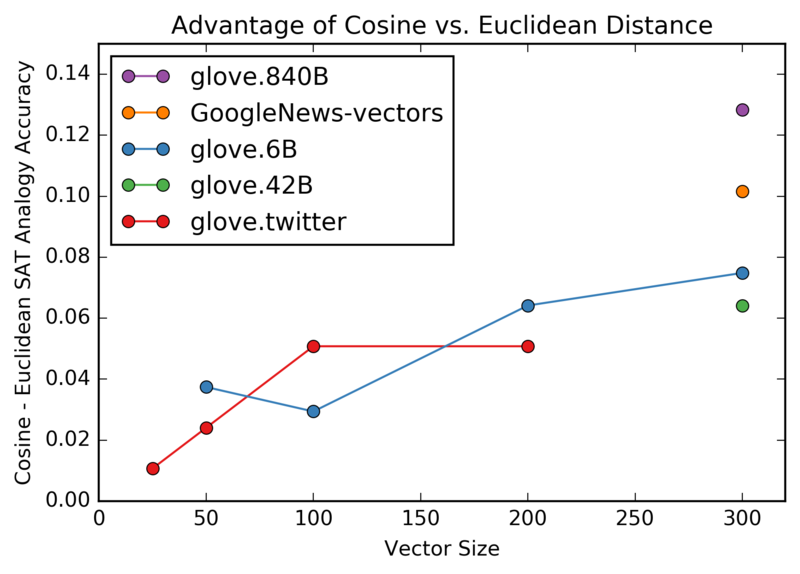 Cosine distance is more effective than Euclidean distance for this task, and the advantage increases with dimensionality.